The other night I was roasting cauliflower for one of our favorite dishes. 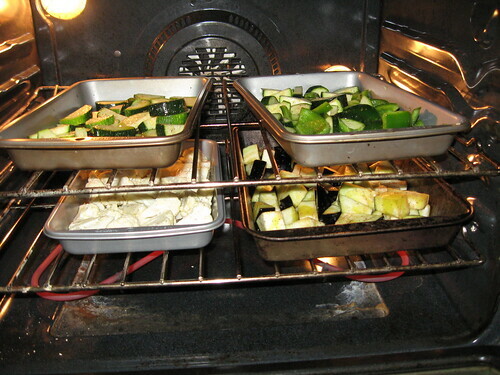 While the cauliflower roasted, I tossed in a few more pans to roast zucchini, green peppers, and eggplant chunks. I tossed the latter 3 roasted veggies/fruits into a large bowl for the next night and went on to prep the cauliflower dish. The next night, I took all the roasted veggies and simmered them with some garlic, basil and tomatoes for about a half hour. 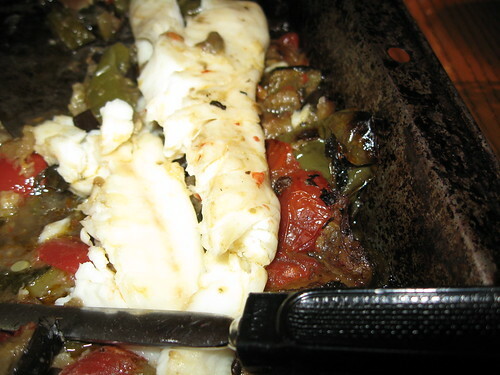 Nice and soft, I took the mixture and ladled it into a shallow bake pan and place a few tilapia fillets on top. The entire mixture was baked with the fillets getting a small squirt of lemon juice and olive oil half way through the 20 minute bake at 350°F. The entire dish rested and 3 portions were served up. I saw this pairing in a magazine the other day and couldn't imagine the ratatouille would be good with the fish, but it was wonderful ... and fast. Definite new favorite for us.